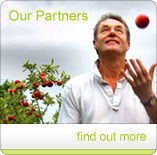 The family has grown apples, pears and plums for over 100 years. Originally, the farm was, like many, mixed, and sheep, cattle and poultry were grazed under standard fruit trees. Only one old standard Bramley orchard remains as a testimony to what once was. In the mid 1980's, intensive conventional farming systems based on synthetic agrichemicals and fertilisers were increasingly being questioned as production intensified and monoculture dominated the farming sector whilst habitat and biological diversity declined. We began to recognise a strong demand for affordable food that came with a provenance, produced using more sympathetic systems. With considerable help from the scientists at East Malling Research Station, we switched our production to a fully Integrated Crop Management (ICM) system. The field margins, hedgerows and waterways were enhanced, restored and managed to create the optimum habitat for predatory insects and our chemical inputs were all evaluated for their environmental impact as well as their price and efficacy. Out went residual herbicides and cheap ‘slash and burn' non-specific pesticides, to be replaced with products that left predatory insects such as anthocorids, ladybirds, lacewings and typhlodromus mites intact to help fight the battle against such difficult pests as bluebug aphid, pear sucker and fruit tree spider mite; we also aimed to leave populations of 'neutral' insects untouched. The change in herbicide policy produced a flush of opportunistic annual weed species within the orchards that provided a late summer bonanza for insect and seed eating birds resulting in a significant increase in both diversity and number. The farm continues to participate in the RSPB Farmland Bird Survey. Initially, we struggled with the lighter touch of the ICM system, but as time has gone by, the chemistry available has become more sophisticated and the insect predators and pollinating insects on the farm more numerous. ICM is now the industry norm, and since 1997, producers have been audited annually under The Assured Produce Scheme. Driven by European legislation, The Department of Farming and Rural Affairs (DEFRA) is currently investigating extending the concept of ICM to a fully Integrated Farm Management (IFM) system which is intended to deliver on the triple bottom line of Economic, Social and Environmental benefit across the UK farming industry; we are currently working with Sainsbury's as they develop their own sustainable sourcing agenda. The farsighted systems developed and adopted by HE Hall & Son over many years should be well suited to this change in emphasis. We primarily produce the ‘King of Cookers', The Bramley. These huge bright green apples combine a wonderful sweetness with great natural acidity. When stewed, they break down to foaming perfection - the only filling for a crumble or a pie! The heavy clay soils of the Low Weald are ideal for our main pear variety, the fabulously sweet, Conference. These are great to eat fresh or perhaps to poach in a little red wine as a delicious autumn pudding. In early September, the trees groan under the weight of another massive pink and purple crop of Victoria and Marjorie Seedling plums. Again these are delicious fresh, but how about a Plum Cobbler and thick, thick cream?